The Royal Worcester factory was founded in 1751 and is the oldest factory still producing wares today. The original owners held a trade secret that was protected by a fine of £4000 to the one who divulged the secret. They used kaolin clay, granite, and soapstone to produce the tea services which were highly popular in those days. In 1789 the factory began producing porcelain for the royal family and still produces pieces for them today. In the 1850s the factory came under new ownership after a fire caused extensive damage. New machinery helped boost production and quality. 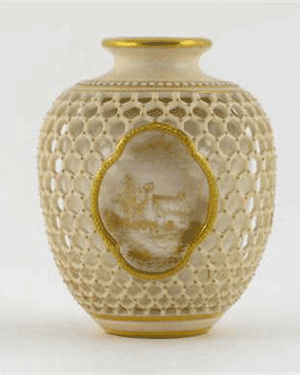 George Owen began working for Royal Worcester in 1859. 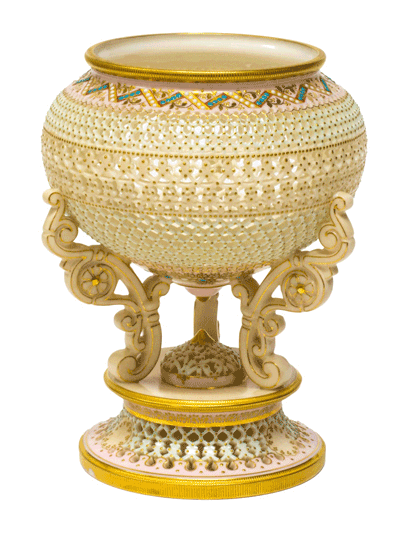 He perfected the art of pierced porcelain designs, sometimes called reticulated porcelain. China was the birthplace of reticulated designs. To create the distinctive look, one wall of ceramic is intact inside an outside wall with piercings. The piercings have a look of lace, and they come alive with the coloured ceramic showing through behind the piercings. George Owen was one of the few artists to master this highly skilled technique. If the piercings are improperly executed, the piece will not stay intact during the firing. Just one cutting mistake would mean starting over. Owen was skilled at the complicated patterns that made reference to carved ivory. He dipped a knife in oil and made the carvings into wet clay. Then he overlaid the pierced clay onto the plain forms before firing. English collectors began buying George Owen’s pieces in the mid-1800s. His degree of perfection and skill is still unmatched. George Owen worked alone, so his techniques and processes have never been replicated. He only created custom pieces which drew a high price from clients. This set him apart from all other porcelain makers at the time. He did not get paid on a weekly basis; instead, he was paid per order, which was highly unusual even for other master craftsmen of the era. If you would like a free, no obligation valuation of your George Owen Royal Worcester please use the form below. You can also email details about your George Owen to [email protected] or call us on 01270 440357.